Smallest high gain VHF antenna on the market. Incorporating the same compact engineering which distinguishes the ClearStream family, the C5 is targeted specifically for the high VHF band. (Ch7-13 ; 174 -216 MHz). Purposely built for high VHF, the ClearStream 5’s efficient, compact design offers excellent gain and impedance matching across the whole post 2009 VHF DTV spectrum. The ClearStream 5 is superior to existing combination antennas for receiving VHF DTV signals and offering good directivity with a peak gain of 8.4 dBi. This leap forward in efficient design allows up to 90% of the available broadcast signal to actually reach the incoming antenna cable rather than being lost to impedance mismatches. They are engineered for extra strength and durability, using powder coated aluminium for corrosion resistance and are easy to assemble. Intended to compliment existing UHF antennas, the C5 includes a low loss UHF/VHF signal combiner. 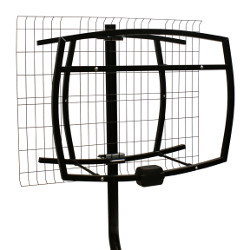 With CHCH and CFTO using a high VHF channel post-transition in the GTA, there exists a need for high VHF antenna that is compact yet powerful.